Next week we will start the excavation of Tomb 3. Well, not precisely start. In 2004, while we were excavating Tomb 2, a first approach to this feature was done. An assemblage of large blades were just appearing in the surface, together with some human bones, brought up by the ploughing. So a survey was done just to define the top of the structure (see publication). 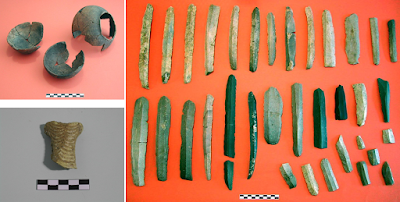 Apart from some human remains, especially teeth (with an anthropological study already published – see here), a fantastic assemblage of large blades was collected (in a very small area, showing that they must have been deposited as a pack). A part from the blades, the top of the structure, affected by the ploughing, also provided some almost complete pots and a fragment of a phalange idol. It is a very promising context.